Yesterday marked an important day for a very special person in my family…Happy Birthday Mema! Now, my mother-in-law, or Mema to my children, is one of the most Godly women I have ever known. To me, she is an example of a Proverbs 31 woman. She is always helping her family and friends and ever striving to make those around her feel cherished and welcome. If you could witness one of our big family dinners you would see what I am talking about. Somehow she manages to cook a fantastic meal, visit with her children, romp around on the floor with her grandkids, help with bathing and bedtime, read loads of books, and still have her hair and make-up look great! Proverbs 31:28 states “Her sons rise up and call her blessed.” I know this is true of my mother-in-law because I am lucky enough to be married to her only son. My own Godly mother always gave me wonderful dating advice and, thankfully, I finally listened to her when I met my husband. “Hilary” my mom said, “never marry a man who disrespects his mother, because if he can’t love his own mother, he will never know how to love you.” At that time, I took the advice, but didn’t really understand the true meaning behind the statement. As a mother of two small boys, I finally understand that in teaching them how to love and respect myself and others, I am also teaching them how to love and respect their future wives. Wow! It’s almost too overwhelming for this mama. Truly, I am blessed to have a mother-in-law who taught her children the meaning of love and respect, and most importantly, that these things can only come from a relationship with Christ. I am blessed that my mother-in-law, no matter how knowingly or unknowingly, raised my husband to be Godly man who loves and respects his mother and, therefore, loves and respects me. So when faced with what to get my mother-in-law for her birthday, I began to worry, progressed to fidgeting, and then I really start to panic. Ahhhh! What do I get a woman who was blessing me before she met even me? After about 5 minutes of panicking (okay, it might have been a day or two), I decided to make something for her newly remodeled kitchen/hallway/dining room. I wanted to give her something to hang on the wall that she would cherish every time she saw it. So, an idea began to form. Before I knew it, I was making a plaque of her grandchildren especially for her. The first thing I did was gather some supplies. 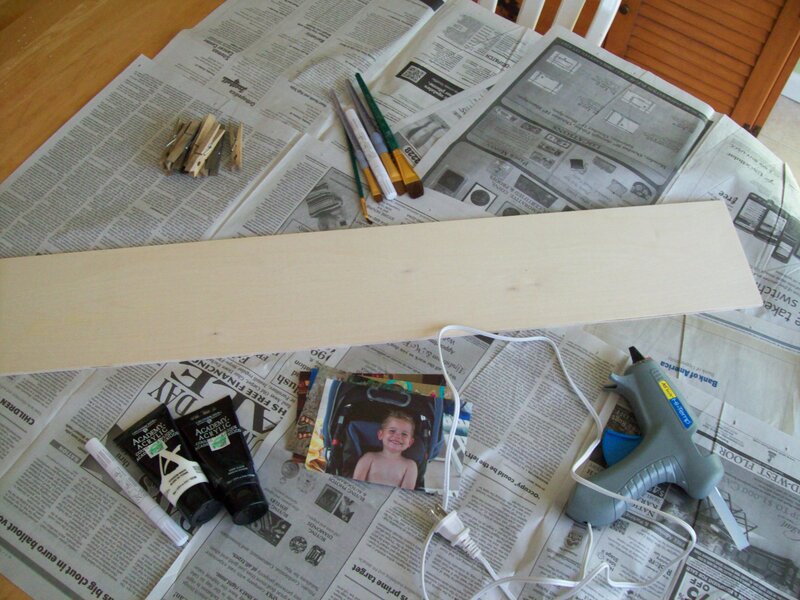 To begin, I covered my work surface with newspaper and laid my supplies out. Next, I painted the board white on one side as well as all four sides of the board. Crafter’s Tip: Make sure you lift the board off the paper after it has dried a little and move it over, or it will stick to your paper. You can also elevate the board using paper cups or other similar disposable items. After applying a good base coat, I let the paint completely dry (about 45 minutes). 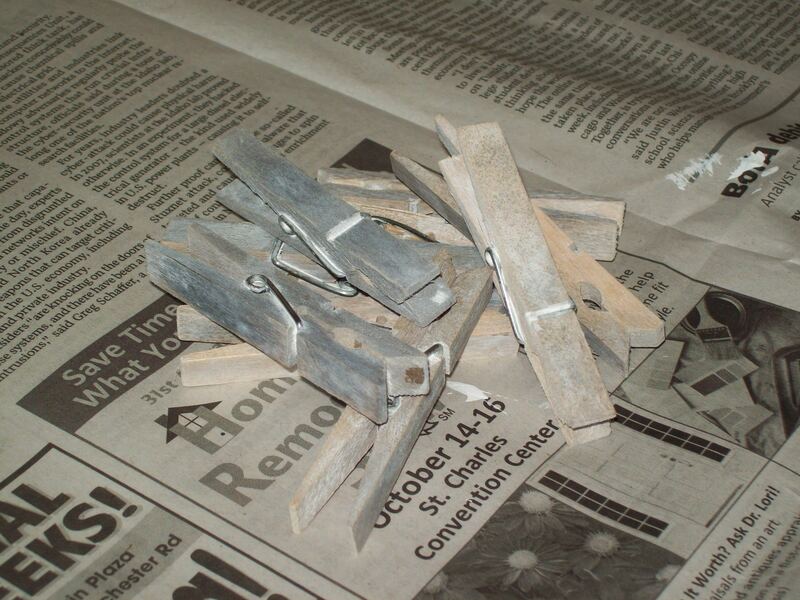 While the base coat is drying, you can start working on the clothespins. I added a little water to some white paint on a paper plate to make a whitewash effect. I then painted each clothes pin one by one, let the paint sit for about 30 seconds, then wiped them with a clean rag. I think they turned out pretty cute, don’t you? 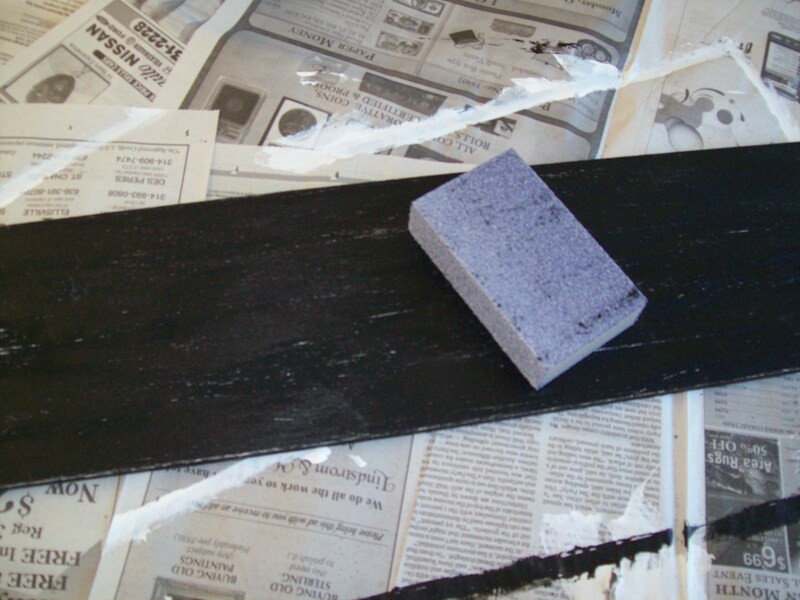 Next, I covered the white board with coat of black paint and let this dry. This took about an hour to completely dry. I took coarse sandpaper, and rubbed the wood, ALONG the grain, to give the plaque an aged, shabby, chic feel I was going for. I took the clothespins and lined them up neatly on the bottom of my board. If you want to measure your clothespins out with a measuring tape, you can, but I chose to just eyeball it. 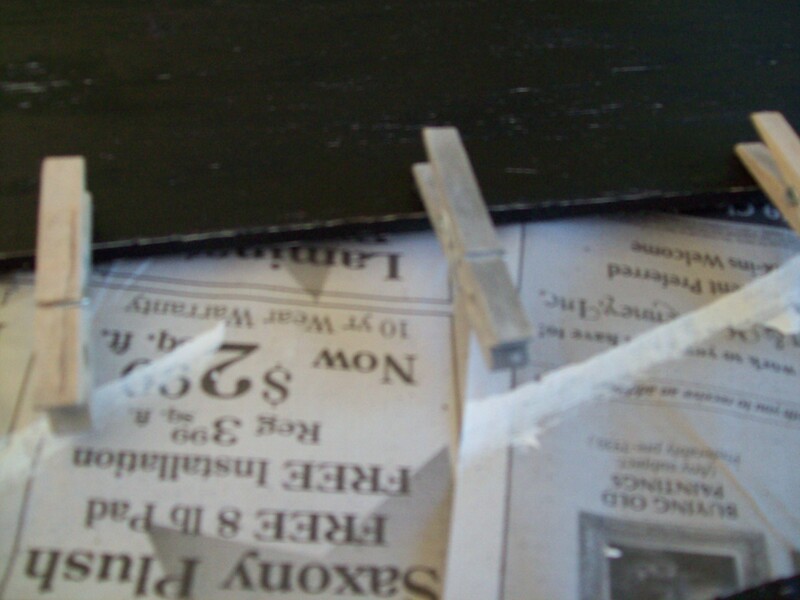 When I had placed the clothespins where I wanted them, I placed a small dab of hot glue at the top of each pin, and glued it to the board. After letting the clothespins dry, I started writing my letters on the board. Now, if you don’t feel comfortable writing your own letters, please feel free to use stencils. Here’s a link if you need help http://www.ehow.com/how_7638788_stencil-letters-wall.html. You can usually pick stencils up at any craft store or order them online for a fairly reasonable price. I wanted a more handmade look, so freehand was perfect for me. One trick that I have learned is to write my letters how I want them on a piece of paper directly above my work. This helps serves as a template to guide my font and spacing as I write. Also, you can see that I personalized the plaque by adding my parents-in-laws names. 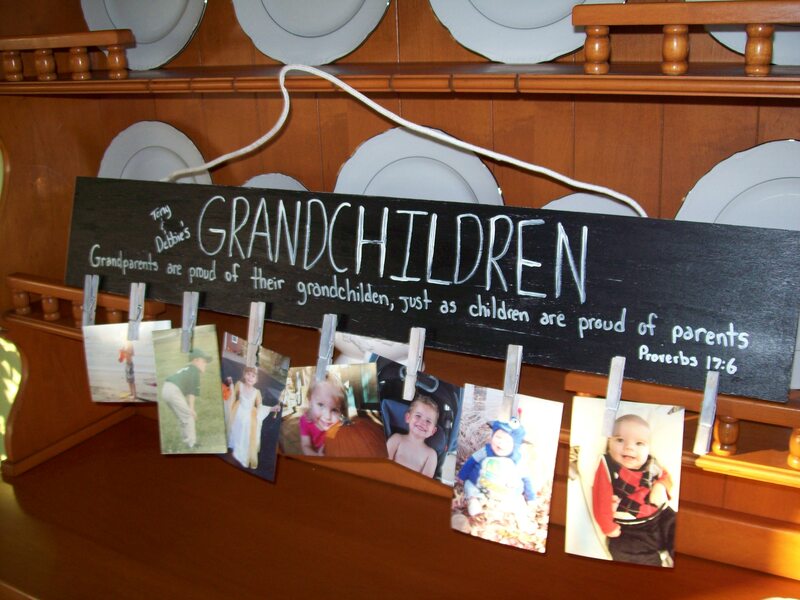 To personalize your own plaque you can add other decorations such as your kids handprints, a drawing of a stick-figure family, flowers, etc… What ideas do you have to personalize your Grandchildren plaque? Finally, I glued my piece of clothesline (or ribbon) to the back of the plaque and add my pictures. Personally, I think it turned out really cute, don’t you? I gave it to my mother-in-law last night and she really seemed to love it. 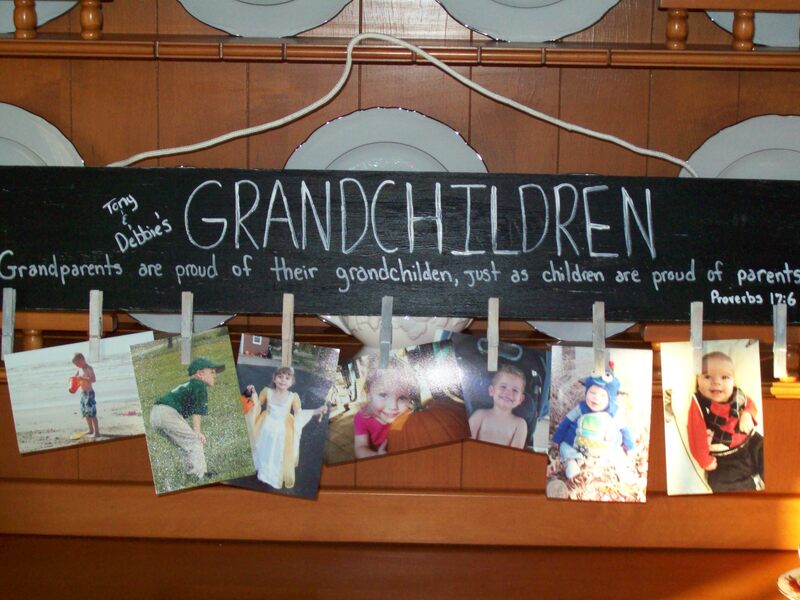 So, if you have a parent or grandparent who has been a blessing in your life, why not make them a Grandchildren plaque. Let them know you call them blessed.